“Cold Molding” is a labor intensive process typically reserved for “Custom” boat builds. 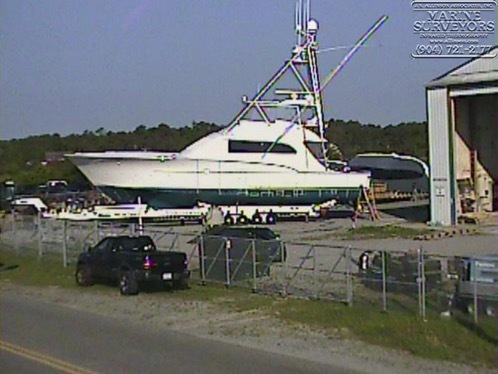 More often than not this process is used for Convertible Sportfish boats used for offshore fishing tournaments. A boat of this pedigree typically takes at least a year to complete and sells for over three million ($3,000,000.00) USD. 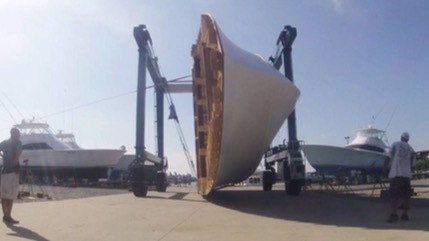 The “Cold Molded” process uses strips of thin wood veneers and epoxy resin to create the complex shape of a boat hull. 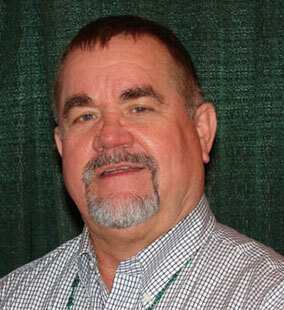 The author is an Accredited Marine Surveyor (SAMS-AMS), Infraspection Institute Master Thermographer, co-author of the Standard for Infrared Inspection of Recreational Yachts & Small Craft Constructed of Fiberglass Reinforced Plastic and Composite Materials published in 2011 (aka “The Standard”) and has used Infrared Thermal Imaging in his Marine Surveying business since 2003. 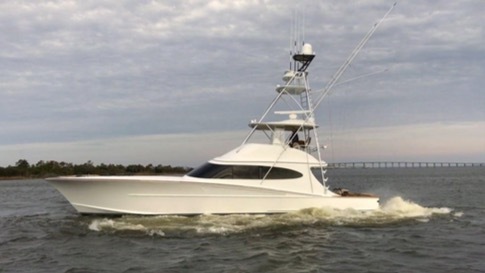 This year’s presentation will demonstrate how the Standard was used to detect moisture intrusion in a Sixty-Six (66) foot custom convertible wooden cold molded sportfishing boat. 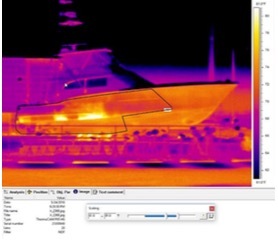 When inspecting the “condition” of floating vessels, more often than not a proper analysis and interpretation of surface Infrared Thermal Image patterns compliments a visual inspection. We opine that if one follows the applicable sections of “The Standard” you will have an excellent source for basing defensible opinions of the condition of the vessel. 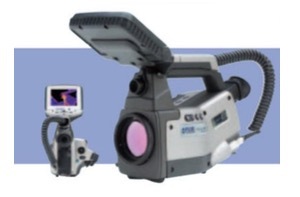 “The Standard” is a twenty (20) page document that was written and published in 2011 after eight (8) years of in the field experience with applying infrared thermal imaging to various requirements needed to document findings and produce a defensible report of a Marine Survey. 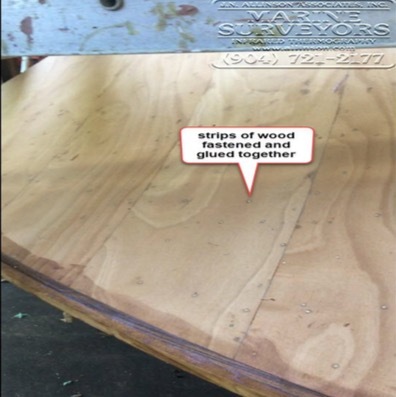 The “Cold Molded” process uses strips of thin acume plywood wood veneers and epoxy resin to create the complex shape of a boat hull. Boat hull is built on a jig upside down and in an indoor controlled environment. Example of temporary fasteners holding glued strips of wood in place. Completed boat hull moved outdoors where it will be flipped right side up using a travel lift. Why a cold molded boat? The cold molding process produces a stronger and lighter hull versus traditional wooden planks affixed to frames. This translates into boats built with a smaller horsepower requirement for propulsion engines and excellent maneuverability. More often than not predator game fish like billfish (marlin and sailfish) appear to respond best to the harmonic vibrations from a wooden hulled vessel. Game fish are sight predators and once they swim to investigate the source of the noise they respond to the various lures and teasers trailing in the boat’s wake. The subject boat below was completed in 2009 by a company that is no longer in business. 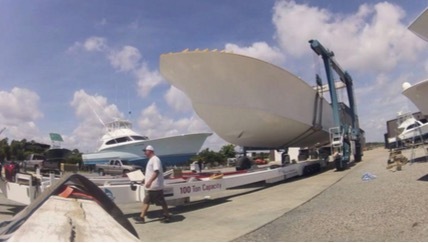 During the haul out process, an aft STARBOARD section of the hull side gave way when stressed by the straps on the travel lift. A visual inspection of the damage concluded that the structural integrity of the hull had been compromised by wood decay from water intrusion. Based on findings documented in the above photographs, J.N. 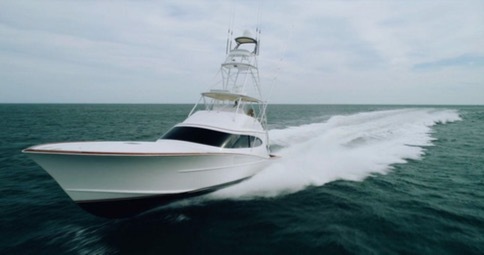 Allinson Associates, Inc. was retained by Bayliss Boatworks to locate and map “suspect” areas of moisture intrusion into the cold molded material. 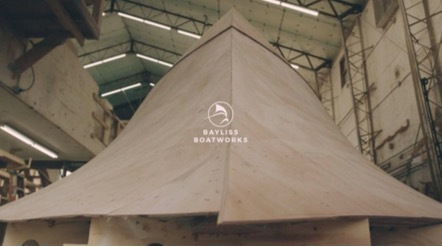 Bayliss Boatworks used these findings as input for preparing their cost for repairs. The scope of services was set to inspect the visible accessible surfaces of both PORT, STARBOARD, BOTTOM and STERN from the exterior of the boat. 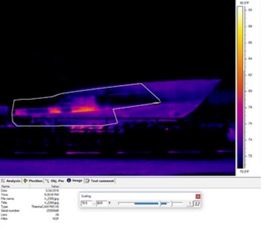 Visual inspections, moisture meter readings, percussion soundings and computer software analysis of the infrared thermal images revealed moisture intrusion on the PORT, STERN, and STARBOARD hull sides and isolated areas on the hull bottom of the boat. 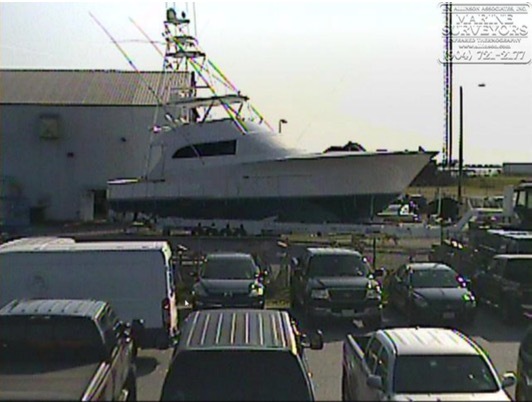 Select areas of Destructive Testing on the PORT side of the boat confirmed moisture intrusion. it is the opinion of J.N. Allinson Associates, Inc. that sections of the wood in the PORT and STARBOARD hull sides were “wet” and will decay and deteriorate when exposed to environmental conditions that support wood destroying organisms. The boat was stored in the open on a hydraulic trailer. In accordance to criteria as set forth in “The Standard” the boat was oriented with the STERN facing North and the BOW facing South (see Exhibit I). This North/South orientation is preferred when doing infrared studies that rely upon solar insolation over a diurnal period to evenly warm and cool the boat. Given the documented environmental conditions, the positioning and orientation of the boat, J.N. 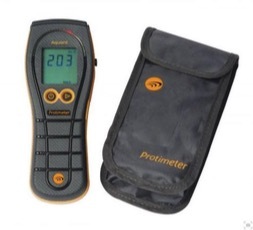 Allinson Associates, Inc. is of the opinion that the interpretation of the thermal patterns from the infrared thermal images obtained during the study period are valid. Figure 3. Same image as Figure 2 with temperature span adjusted, color of border changed to white. Figure 5. 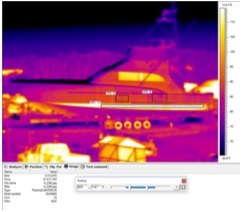 Infrared thermal pattern anomaly on PORT side during the morning. Temperature within the bottom border is much hotter than bordered areas of the hull above. Figure 6. Same image as Figure 5 with temperature span adjusted and different color palette. Figure 7. “WET” moisture meter reading to confirm where to cut coupon in hull. Figure 8. Cutting a 2” inch coupon with a hole saw. Figure 9. 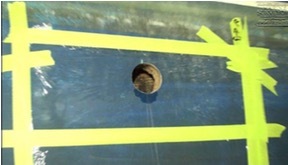 Clear plastic barrier affixed over coupon to document any moisture leaving the hull cavity. Figure 10. Evening check of clear plastic barrier showed moisture accumulated behind clear plastic barrier. Figure 11. 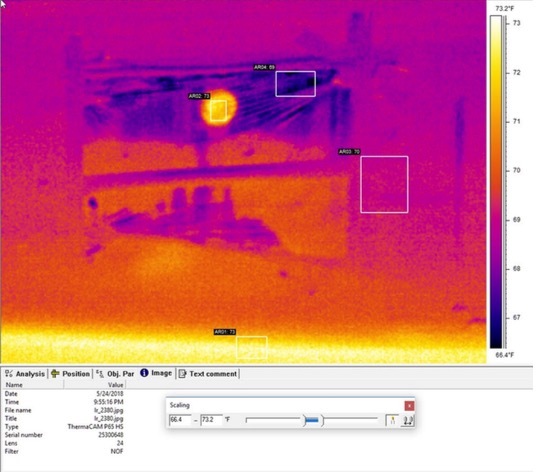 The above infrared thermal pattern shows how hot moisture vapor traveled upward and accumulated behind the clear plastic barrier where it condensed and fell to the bottom of the plastic. J.N. 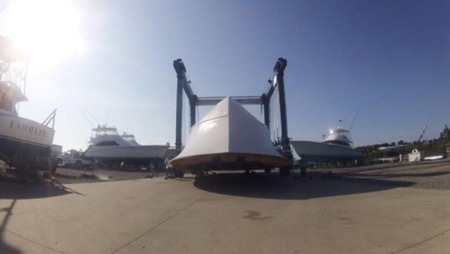 Allinson Associates, Inc. opines that this cyclical evaporation and condensing of water occurs within all of the air cavities in the hull construction of this boat that are isolated from air conditioning. 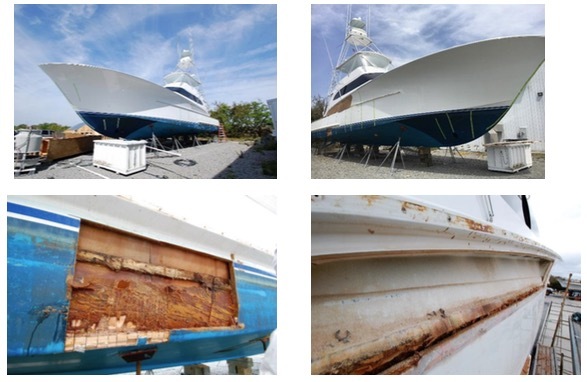 Under favorable environmental conditions the wood surfaces that are not treated to prevent moisture intrusion will develop wood destroying organisms (WDO) leading to “structural” hull damage. 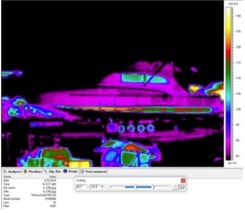 Standard for Infrared Inspection of Recreational Yachts & Small Craft Constructed of Fiberglass Reinforced Plastic and Composite Materials.